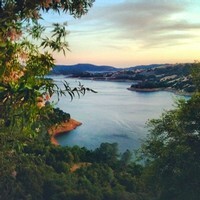 Villa Vallecito Vineyards is more than just a vineyard. Located in Murphys, CA, an up-and-coming wine region in the Sierra Foothills, Villa Vallecito offers an getaway where you can imagine you’re a winemaker for a moment, overlooking your vineyards, enjoying the fruits of your labor. Driving through the ornate iron rod gate and winding our way up to the estate reminded me of the times I’ve stayed at century-old, family-owned vineyards in Italy. Owner Ghee (pronounced ‘G’) Hagedorn, a petite but fiery woman, came out to greet us. Ghee poured a crisp, tart 2011 Villa Vallecito Viognier and we were off to check out the ‘Mi Compania Dulce’ casita. Atop a hill, the one bedroom vacation rental with full kitchen decorated in Mexican rugs and art gave away to 360-degree views of the New Melones River and rolling hills of vineyards. “It’s like being on top of the world,” says Ghee about a stay at Villa Vallecito’s casita. Although the property had a feel of an old Mexican hacienda, we discovered it was recently built as Ghee’s labor of love for her family (she comes from a migrant Mexican family of fourteen), wine and hospitality. And picturesque it is. My friend and I had massages poolside and then went to soak in the hot tub overlooking the entire valley with a 2008 Villa Vallecito Barbera that had won a bronze award in the 2011 San Francisco Chronicle Wine Competition. Wine in hand, we watched the sunset and relaxed our road weary bones while Ghee whipped up some dinner. We hadn’t planned to stay for dinner, but neither of us wanted to leave this slice of High Sierra tranquility. “Our guests feel the same as you. Before they arrive, I always tell them to pack in all the supplies they think they want, because they won’t want to leave once they get here,” Ghee says with pride. The care and attention to detail is a running theme throughout Villa Vallecito. 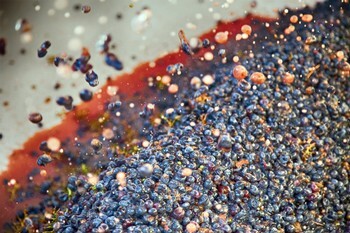 Their wines from the 13 acres of vineyards are hand picked and hand sorted. Villa Vallecito’s local winemaker Nathan Vader makes sure to create ‘big, bold, beautiful’ wines, just the way Ghee likes them. “I like to say Nathan courts his wines. He takes such good care of them,” explains Ghee of the winemaker’s romance with the fruit of the vine. Up to this point, you could only sample Villa Vallecito wines by staying on the property or arranging a private tasting. Now, the ever-industrious Ghee and her husband Alan, have opened a tasting room in historic downtown Murphys. 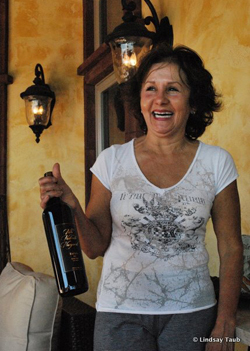 At the Villa Vallecito tasting room, there are seven varietals to try including: Viognier, Cabernet Sauvignon, Grenache, Payaso, Syrah, Barbera and Barbera Reserve. Payaso is my favorite, not only for its rich, vibrant flavor profile, but also because of its heritage. It was made and named after Ghee’s late mother Beatrice whose favorite song was Sad Clown. Payaso means clown in Spanish. For an off-the-beaten path wine vacation, Villa Vallecito Vineyards is decadent yet earthy, just like a fine wine. 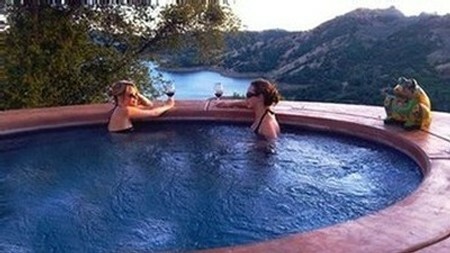 To stay at Villa Vallecito, it’s $225 nightly rate, 2 night minimum stay. Click here for a photo tour and reservations. Photos of Owner Ghee Hagedorn and Villa Vallecito Barbera wine by Lindsay Taub, the rest are the authors Lanee Lee.